The posted frame case has side doors, frets, bell strap and bell, 5 finials and a hook and 2 spikes. 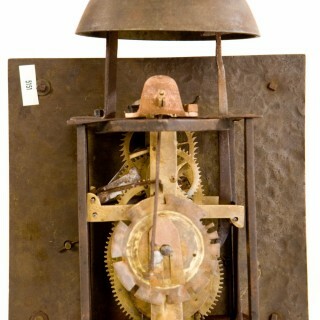 It has good original wheel and metal work and verge escapement. 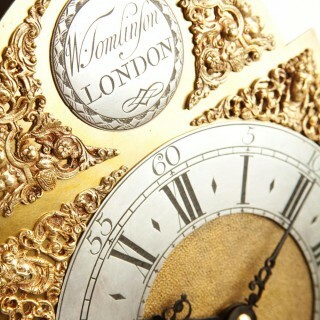 The ¼ striking is on the centre train via a countwheel on a single small bell and the hour striking is on the rear train via a countwheel on the large bell. The 8″ dial has corner spandrels, a chapter ring with diamond ½ hour markers, a matted centre and a signature boss in the arch. William Tomlinson was born in 1673 near Preston (Lancs). In 1699 when he married he was working at the dial and three crowns, London. He married again in 1721 and his address then was Gracechurch St. He was a maker of fine clocks. 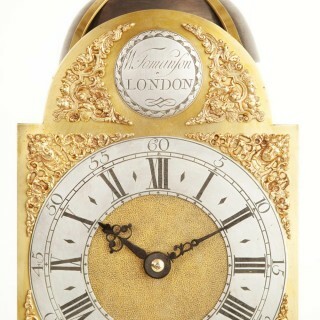 A rare 3-train ¼ striking lantern clock by William Tomlinson, London C.1730.